"And there is a monster. I think I can convince you." 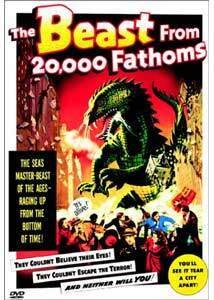 The Beast from 20,000 Fathoms is significant in film history in a number of ways. It ushered in a rampage of giant monster films during the 1950s, not to mention giving voice to a growing suspicion that atomic energy might not be quite as safe as the government was claiming. It brought Ray Bradbury to the attention of Hollywood, and most importantly, it was the first solo effects effort by the great stop-motion wizard Ray Harryhausen. Atomic Energy Commission physicist Tom Nesbitt (Paul Hubschmid, billed as Paul Christian) is heading an atomic experiment of unspecified nature in the Arctic. Nesbitt is rescued from an avalanche, raving that the experiment has awakened some kind of monster. The military scoffs at his story until boats off Labrador and Nova Scotia are attacked, and a foghorn on the coast of Maine is destroyed. Nesbitt convinces paleontologist Dr. Thurgood Elson (Cecil Kellaway), not to mention pretty assistant Lee Hunter (Paula Raymond), that he has in fact found a revived dinosaur, a Rhedosaurus. Unfortunately for all concerned, the dinosaur's old stomping ground happens to be New York City, and it has decided that it's time to see what's new in town. The cast is about what is to be expected for a low budget film (the entire film was shot for under $200,000). Hubschmid is an odd choice for a leading man, and no attempt is made to hide or explain his Germanic accent, other than putting some ludicrous-sounding American slang into his dialogue. The love interest is entirely perfunctory and Raymond doesn't contribute much enthusiasm or interest. Cecil Kellaway does get in a few good bits as the initially skeptical scientist who comes to achieve an ill-placed fondness for the creature. Kenneth Tobey, who made a career out of playing military and police types, has a few decent moments as he half-heartedly looks into Nesbitt's wild stories. But the point of this exercise isn't the human cast at all; it's the Rhedosaurus monster, based on Bradbury's The Fog Horn, a story (or sketch, really) about a dinosaur awakened from its deep sea slumber by the romantic booming of the title instrument. Indeed, the Rhedosaurus attacks a lighthouse here, although for reasons unexplained in the extras the fog horn itself is left out of the picture. The Rhedosaur is entirely mythical, although there is in fact a Rheotosaurus, though it was found in Australia in the early Jurassic period. But Harryhausen convincingly brings it to life with superb artistry, allowing it to interact with the Wall Street exteriors through a complex double-matting process. It's a wonderful pleasure to be able to examine Harryhausen's work on this DVD frame by frame; all manner of tiny gestures and subtle movements by the monster can be picked up in this manner, allowing an insight into the creativity that made this beast so memorable. And memorable it was. Though much of the picture is needless padding (there's even a ballet sequence for no good reason), the last twenty minutes with the trademark rampage through Manhattan and the climax at the Coney Island roller coaster make the delays worthwhile. Nonetheless, there could have been some better script choices made in the first hour. For example, a good chunk of time is spent with Nesbitt trying to convince others of what he saw and his resultant doubts about his own sanity. Had the monster not been clearly seen early on, this would have made more sense and even injected a modicum of suspense. Of course, the eight-year-olds promised a rampaging dinosaur by the poster and trailer would no doubt have rioted. More perplexing is the failure to do much with an intriguing secondary idea: that the Rhedosaurus is not only on the rampage, but that it carries all manner of deadly prehistoric viral diseases. Such a notion was never picked up by any of the many imitations, and it sadly only presents an opportunity that is not well developed at all here. Nonetheless, this is a critical picture in science fiction history, and it still holds up pretty well today. Indeed, in some ways it holds up even better, since a cold-blooded dinosaur wandering around in the Arctic would have quickly been reduced to complete torpor. But if paleontologist Robert Bakker's much more recent theories are correct and dinosaurs were warm-blooded, such a massive beast probably could function in cold temperatures for a while at least. But pay no attention to the silly liner notes, which imply that Harryhausen built the monster in actual scale and somehow animated a 50-ton statue! Image Transfer Review: The original full-frame picture looks very good indeed, though the ample stock footage is in predictably rough shape (and no doubt was just as bad in 1953). The film proper is in nice condition, with occasional speckling and a few frame jumps being the sole defects. This of course makes the studio shots stand out even more than usual against the stock shots, but such is the price of a good DVD transfer. Grain is substantial but very well-rendered. Video noise is generally quite under control, with the exception of Paula Raymond's finely patterned dress. Audio Transfer Review: The original mono track is generally well-represented by the 1.0 English track here. There is, however, substantial noise and hiss throughout. Bass is ample in the midrange but the audio is completely lacking in any low bass information, giving the explosions a thin-sounding character. The music is quite tinny and distorted sounding. It's too bad the audio couldn't have been cleaned up as well as the video, but considering its low budget there really isn't much to work with here. Extras Review: Several useful extras are included on this disc, adding to its value. Foremost is a far-too-brief interview with Harryhausen regarding the making of the picture (6m:10s). An apparent outtake (58s) from this interview regarding the construction of the armatures for the Rhedosaurus model is hidden as an easter egg on the Special Features page. More substantial is a 16m:49s filmed 2003 public reminiscence by Harryhausen and Bradbury as they reflect on their 65-year friendship, as well as the making of this film and the origins of the short story. Wrapping up the package are trailers for all of the Harryhausen films controlled by Warner, plus a late effort by Willis O'Brien (of King Kong fame) with Valley of Gwangi and Clash of the Titans presented in anamorphic widescreen; the other two are in the original full frame complete with their amusingly screaming hyperbole. The layer change occurs on a black screen after the lighthouse scene, and thus is hardly noticeable. The seminal giant atomic monster movie, with an attractive video transfer and some very good extras to boot. It's too bad the sound is so rough, but certainly worth a purchase for any sci-fi or animation fan.